Safety and long-time client Antoine Bethea is going into his 14th NFL season with a new deal and a new team. 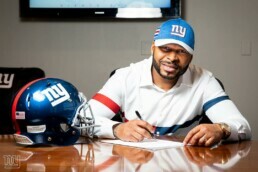 The three-time Pro Bowler and Super Bowl Champion has inked a two-year deal with the New York Giants. Antoine started all 16 games for the 2018-19 season and became the most efficient pass-rushing safety in the league. The Sports & Entertainment Group is thrilled to continue serving as Antoine’s business team and supporting him in all his endeavors.